A little happier with Got Dots now that I’m working on the center. Still not feeling the IQ love, but I think I’m beginning to understand it better. Sorry I didn’t post last week. I was in a quandary. I like the way the top border turned out, especially with the evil thread I used, but I’m somehow… disappointed… too. Of course, that makes no sense, but it brought up a larger dissatisfaction I’ve been having with my work. Working on some borders for In Full Bloom, my Lenten Challenge BoB. I figure I’ll keep adding borders until it’s “big enough” to put on a bed. 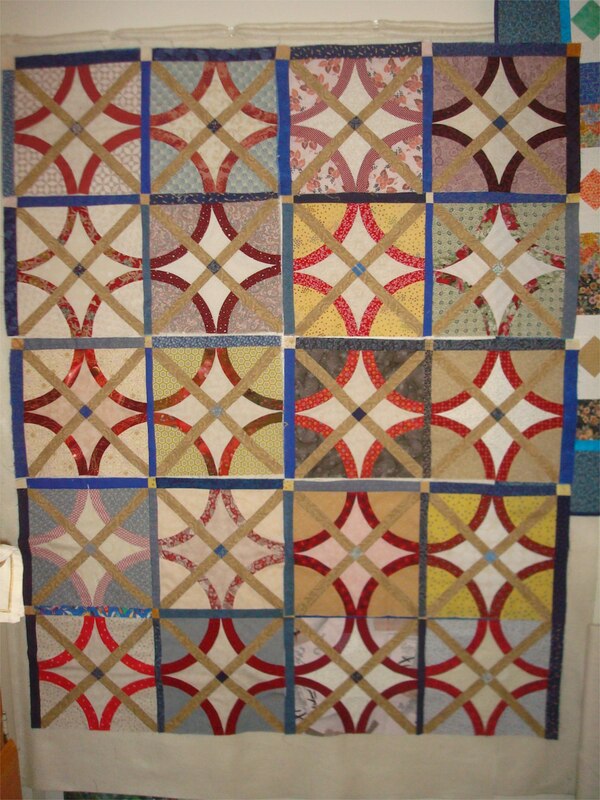 When I’m looking at a real quilt, I look at the overall effect and the decisions the quilter made, etc. I see good things and bad things and tuck away ideas for me to try on my own, later. I do this regardless of the skill of the quilter or the awesomeness (or lack thereof) of the quilt. 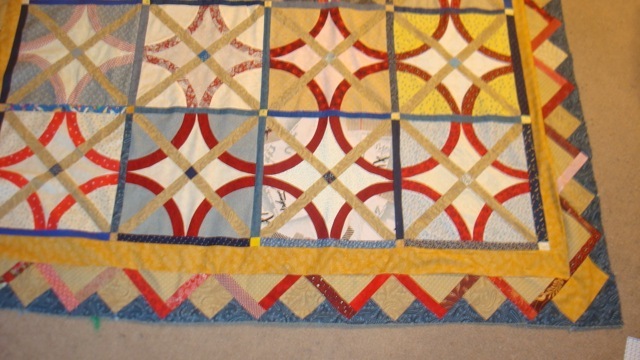 There is always something good and bad to be seen when viewing other people’s quilts. I always learn something. 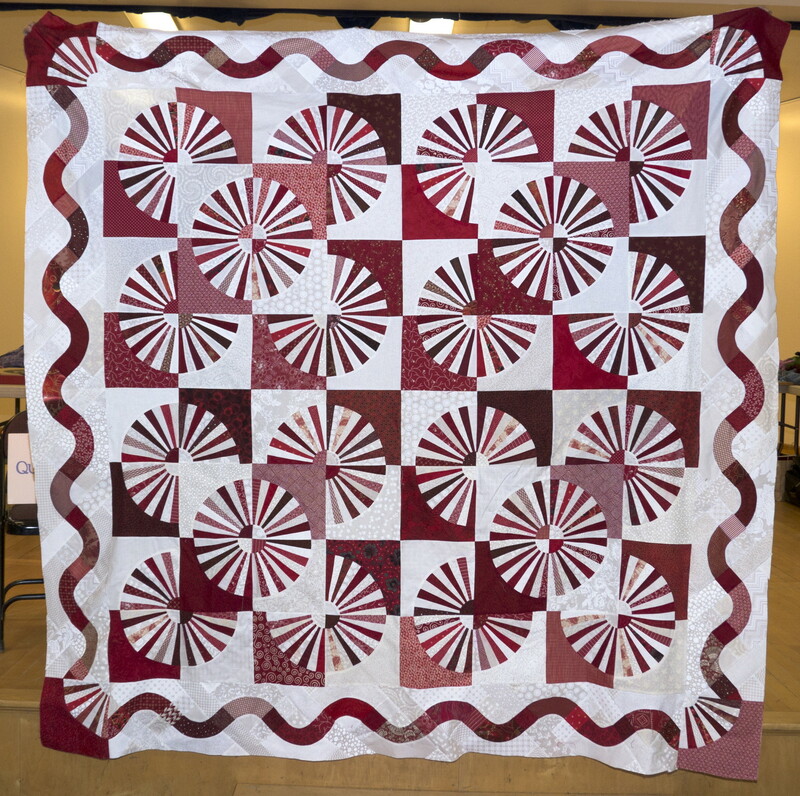 Unfortunately, with the big shows, like the Vermont Quilt Festival, the Tokyo International Great Quilt Festival (which I only dream of going to IRL), and even A Quilter’s Gathering, really, really awesome quilts are hung and I do not learn as much. It’s not because there’s not more to learn, but it’s because I fall in the trap of comparing what I’m doing with what they’ve done. And when I do that, especially with the ribbon winners at shows, I always come up short. Now, I’ve always said I don’t like the densely quilted quilts that seem to be winning all the laurels these days, but that not strictly true. Looking at them as if I were looking at a painting, I see the skill involved and I enjoy the play of the textures and thoughtfulness of the design. It’s not, however, where I am going with my own quilts. 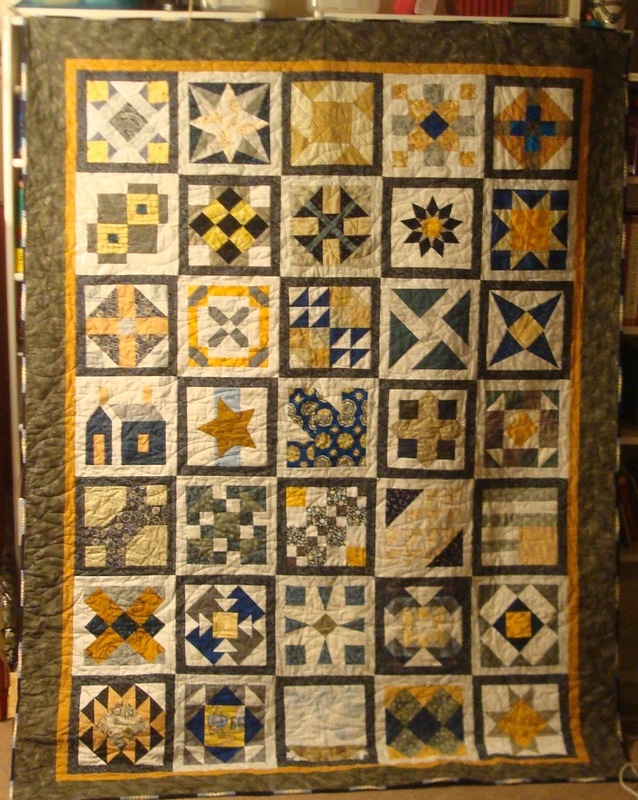 I make utility quilts. I intend for these quilts to be used on a bed, flung over the sofa to be dragged over my legs when it’s cold, curled up on by cats. I see the quilting on these as an additional design element, but not one I want to stand out over and above the other design elements: the colors, the piecing, etc. However, when I’m confronted by the beautifully detailed, densely quilted awesomeness I see at some shows, I shift into trying to do THAT with my quilts and it doesn’t work. 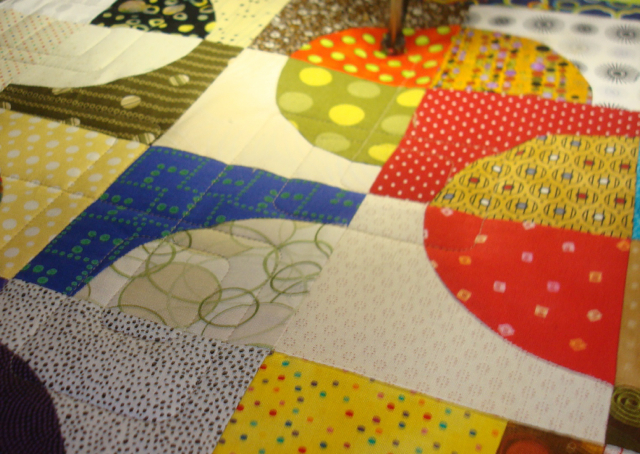 It doesn’t work because I have always intended my quilts to be utility quilts in the best sense of the word. Companion quilts. 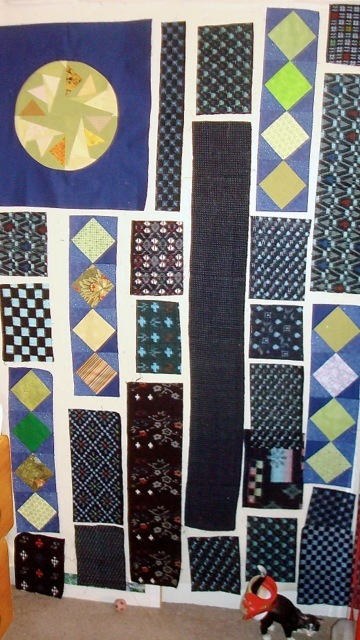 Working quilts. People quilts. And by trying to change them into something they are not, I am just frustrating myself. I am entering into Quilter’s Existential Despair. I guess I have to remind myself sometimes that these “showstopper” quilts I see at shows are designed for just that purpose and that it’s not the purpose of my quilts. 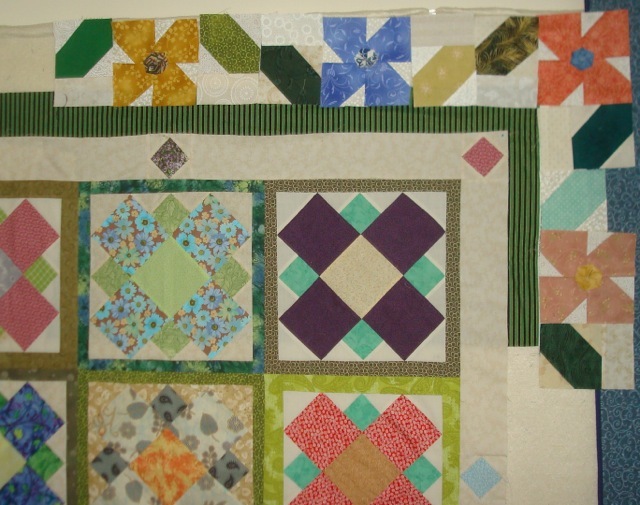 There is a place in this world for all kinds of quilts: showstoppers, utility, traditional, modern, whatever. Every once in a while I just have to remind myself, re-sort my thoughts about it, and just stop comparing apples to oranges. 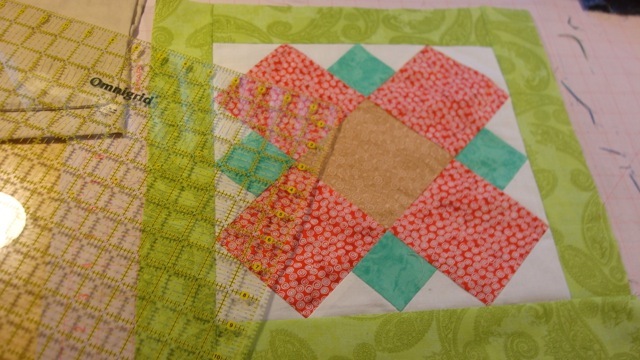 Notice how different In Full Bloom looks with the coping as sashing… and it will sew together FLAT! For some reason, I had trouble sleeping and, basically, tossed and turned in the dark until 3 or 4 in the morning. So I was running late. Everything I did, I did too slowly or it just didn’t work and I had to redo it. Everything I wrote, I had to rewrite and, even then, I wondered if a fourth grader without a dictionary wouldn’t have written it better. Japanese Indigo samples given to me by a friend to make a quilt with. Trying to see if I can combine them with these blocks in some sort of “strippy” design. I was scheduled to visit Cricket and the Beast. I had wanted to get there a little early, knowing that Cricket had an appointment. Of course, I ended showing up 10 minutes LATER than I usually do. You know, some days it’s just better not to leave the house. As for my piecing projects: In Full Bloom is now in one piece. I have to decide on a border. I was thinking of funky, machine appliqued flowers, but I am just about the worst machine appliquer imaginable. I’m actually better (and faster) at hand applique. I could do the funky flowers in spool “pots.” I did a wall hanging that was raffled off a couple of years ago with dimensional flowers in the spool pots and I thought it looked very cute. I’m not sure it would work as a border, though. 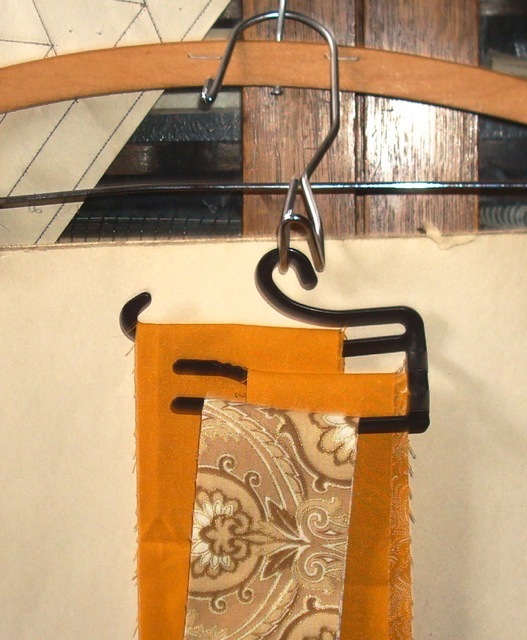 A new discovery for me: this little hanger came with some new socks I bought. It’s the perfect width to keep border strips organized and handy. Cross Roads is still in one piece, but now I’m putting on an inner border to give the proper dimensions so the pieced outer border will fit. It’s sort of like the coping sashing I did for In Full Bloom, but on a bigger scale. To try and get some enjoyment back in my life after such a dreadful day, I started playing with some indigo wovens a friend of mine bought me. I don’t know where she got them (probably San Francisco), but they are from Japan. Not sure that they are “vintage” though. I’m thinking of putting them all in the same quilt and calling it Mood Indigo. You know, after looking at what I’ve been doing for the past week, I feel much better about my bad day. After all, it’s only one day and tomorrow I get another chance at a good day. Grandmother’s Choice is now DONE! Done-done. Done with a binding Done. Complete as shown. Done. One of the big reasons for my BoBs is my participation in swaps. 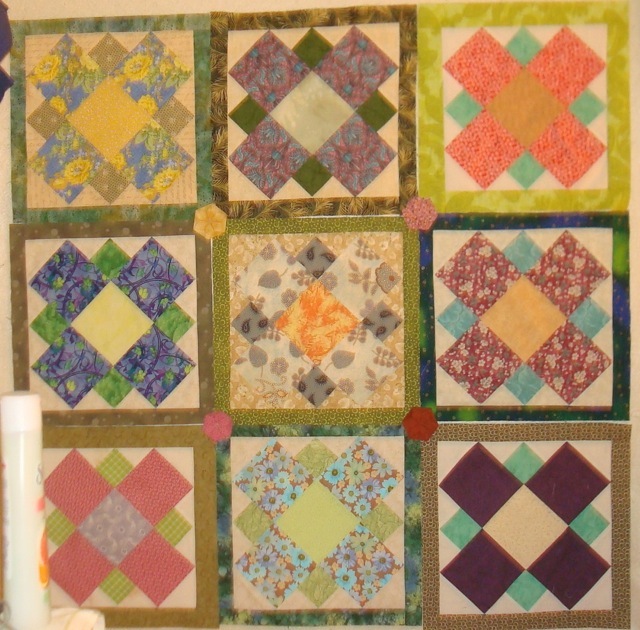 I’ve found that even when the participants are excellent quilters, sometimes the blocks are just a little bigger or smaller than they should be. In the case of Grandmother’s Choice, the quilter was me, and they all should have been the same size (or, to put a point on it, off by the same amount.) Unfortunately, that was not quite the case. This sense of “coping” comes from joinery and is the method of shaping one piece of wood so it exactly fits the piece next to it. This was one of the smaller blocks, so it got wider coping. 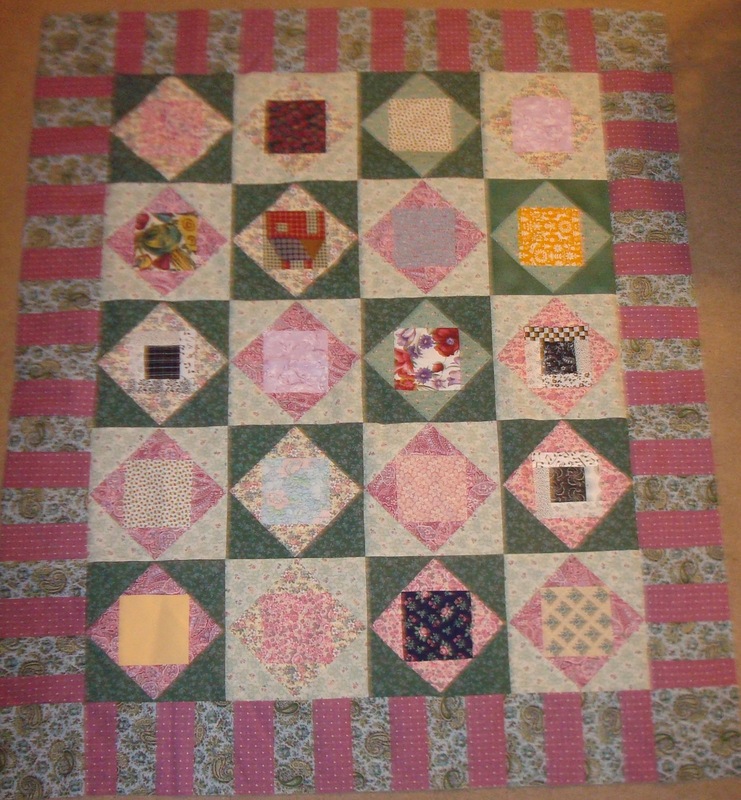 The blocks weren’t off by much, so I simply sewed a slightly larger border on some of them than others. Then I trimmed all the blocks so they were the same size. I matched the corners, treating the blocks with their borders “a regular block” and abutting them rather than using a traditional sashing. In the current BoB, In Full Bloom, some of the blocks are off by as much as 1/2″, so the variation in “sashing” will be much more noticeable, but the corners will match and the wonky whole will look like I planned this from the beginning. If had used same background fabric for all the blocks, say unbleached muslin, I could sew coping strips on the smaller blocks to “extend” those blocks and simply cut them (after sewing on the coping strips) to be the size of the larger ones. Then I could use traditional sashing between them if I wanted. 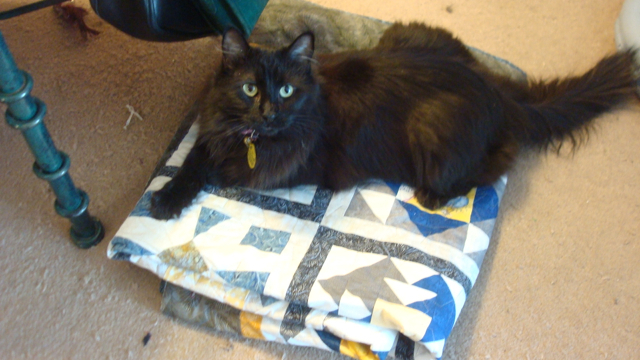 Miko has chosen her first quilt. But, I kind of like the checkerboard effect that I got with Grandmother’s Choice, so I’m coping with In Full Bloom in a similar way: each block will have its own fabric border in green, and I’ll get the checkerboard effect by alternating light and dark greens. 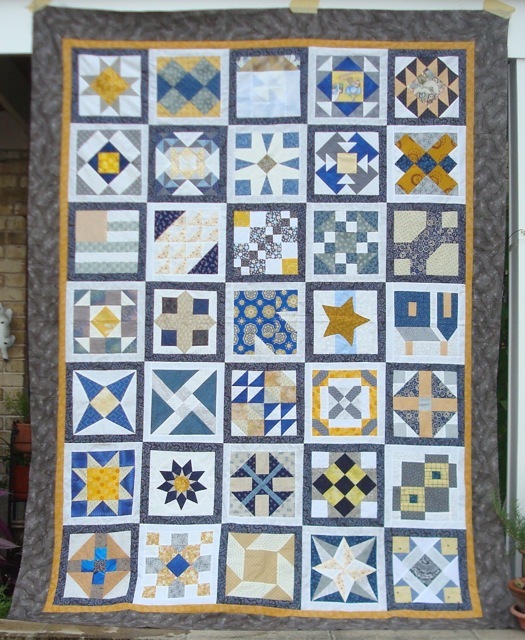 I designed and sewed this Charity Quilt Top using 5″ blocks supplied by my Guild. Les Filles Des Mares is all in one piece (although not in this picture). It still needs borders… I think shopping is in order. 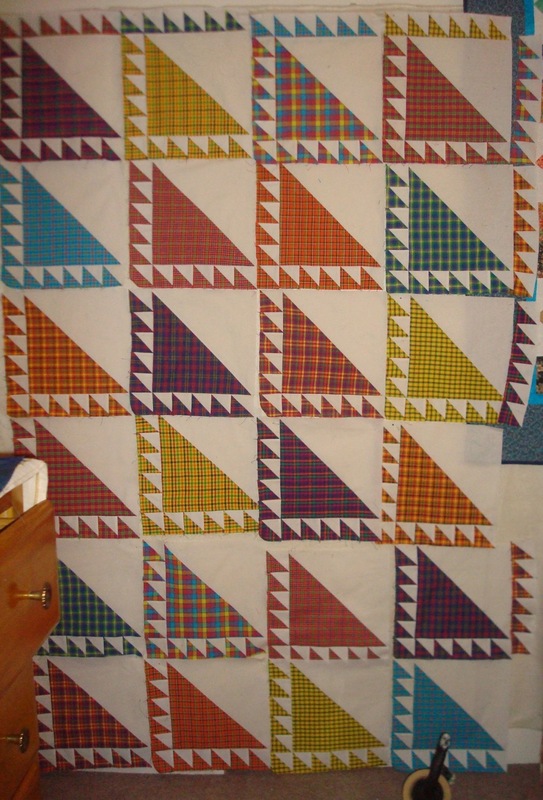 Cross Roads is also a full top needing borders (again, not in this photo), but I’m just happy it’s no longer languishing in my closet in block form.